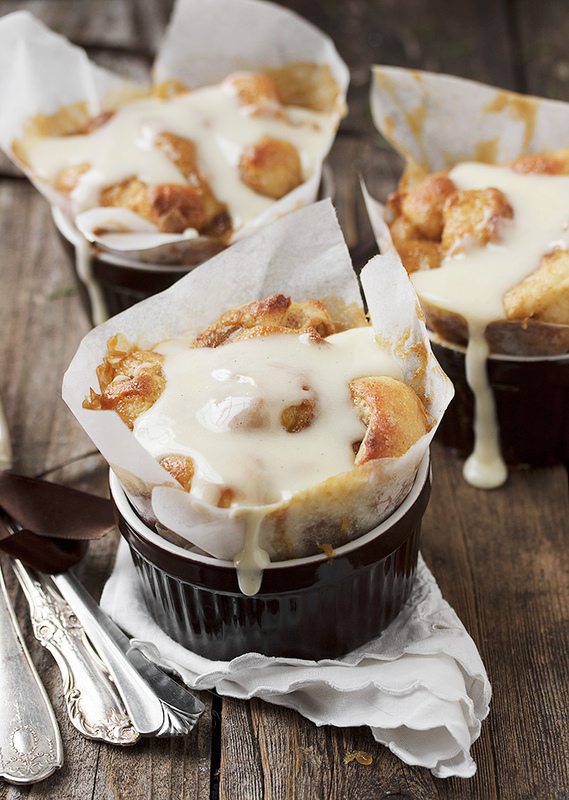 Christmas morning never tasted so good with these Individual Warm Cinnamon Roll Bites with Cream Cheese Icing. And you can make them ahead and freeze them, too! I don’t know exactly when or why our Christmas morning cinnamon roll tradition started, but it’s been running for decades now. 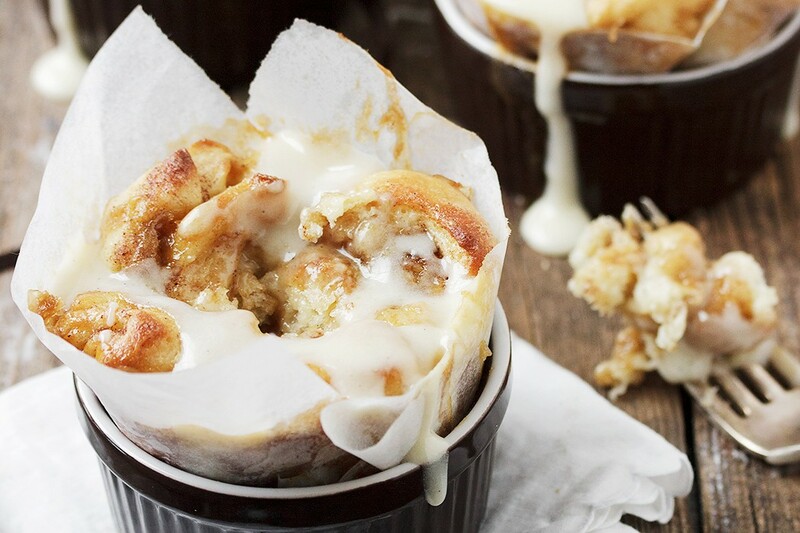 It started out with the old Pillsbury tube ones, then progressed to homemade cinnamon rolls and finally, to these Individual Warm Cinnamon Roll Bites. 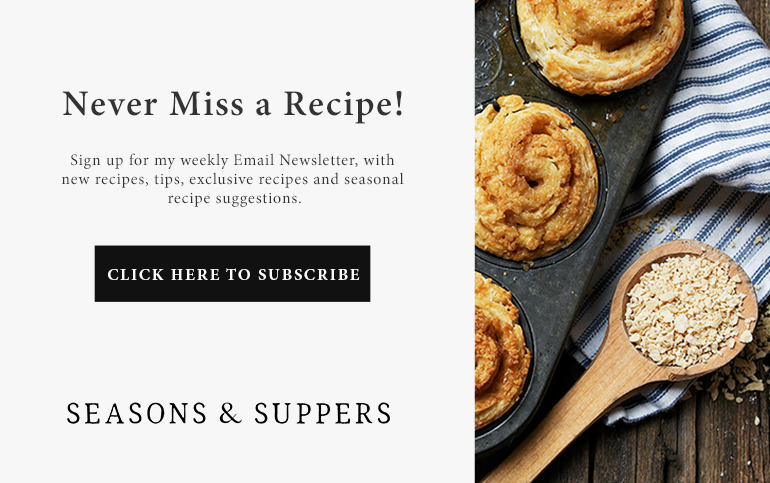 For the past few years, I have been making these ahead and freezing them (right in the ramekins!). I also make the cream cheese frosting ahead and freeze it too. Then on Christmas Eve, I take both out of the freezer to thaw over-night. In the morning, all they need is a quick trip to the microwave to warm and we’re good to go. 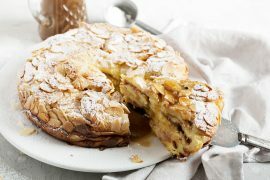 We serve them with homemade fruit salad. I’ve spent some time working on these buns, with the goal of channeling the the famous Cinnabon® Center of the Rolls. After much trial and error, I think I’ve got it! My first few efforts, while delicious, were a little dry. I was after ooey gooey. This final version, declared delicious by my in-house test-tasters, nails it perfectly, I think. 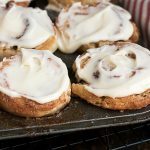 The process of making these Cinnamon Roll Bites involves much of the same process as making traditional cinnamon rolls, except you’ll make 3 smaller jelly-rolls of dough, instead of one large one. 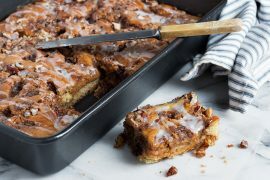 These rolls are then chopped up into small, bite-sized pieces and tossed with some of the sweet brown sugar and butter “goo”, which delivers the ooey gooey part. I also baked them loosely covered with tin foil, so they don’t brown and crisp up. This ensures nice soft bites that soak up the goo and icing. For the final few minutes of baking, the remaining goo is spooned on top to melt in to the bites just perfectly and ensures that all that goodness doesn’t end up at the bottom of the cup. As for the icing, you can spread it on top or I like to microwave it in a measuring cup just a bit so it’s a bit thinner and pourable, so I can pour it over the top. The icing then mixes in with the bites and goo, which is oh so lovely. A delicious and decadent treat, perfect for special occasions or Christmas morning. 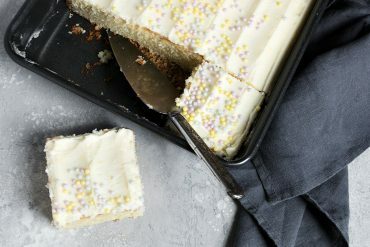 Can be made ahead and frozen, even the icing! Make Brown Sugar Goo: In a medium saucepan over medium heat, melt butter. Add brown sugar and stir well to combine. Bring to a boil, stirring, then remove from heat and stir in cream and salt. Remove to a bowl, cover and allow to cool to room temperature. 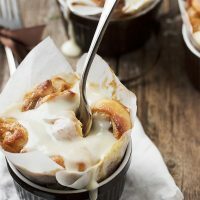 Make Cinnamon Roll Bites: Heat milk in saucepan or microwave until 180° and set aside to cool to lukewarm. In a large bowl or the bowl of a stand mixer, combine flours yeast, salt and white sugar. Add lukewarm milk, egg, vanilla and vegetable oil. Mix to combine. Add more flour, as necessary until dough is moist and smooth. Remove to a greased bowl and allow to rise until doubled, 60-90 minutes. Remove risen dough to a floured surface. Roll into a rectangle 15-inches wide by 20 inches long. Spread dough with softened butter and then combine the cinnamon and sugar and sprinkle dough with most of the cinnamon sugar (reserve a Tbsp. or so). With the short side facing you, cut dough in to 3 pieces 5-inches wide and 20-inches long. Starting with the long side of each strip, roll jelly-roll style and pinch seams together. Place the 3 rolls side by side on a cutting board. Using a sharp knife or a bench scraper, cut the logs into 1/2-inch pieces. Place pieces into a large bowl, sprinkle with remaining cinnamon sugar and toss well. Take 1/3 cup of your cooled Brown Sugar Goo and toss with the dough pieces, mixing well. Prepare 8 ramekins on a baking sheet and grease or line with a piece of parchment paper (I do recommend the parchment, if you have some, as it will help to keep the icing and goo inside instead of going over the edge. Large tulip-shaped muffin lines will also work). Divide dough pieces between the 8 ramekins. Cover with a tea towel and allow to rise until puffy, 30-40 minutes. Pre-heat oven to 350° When dough is ready to bake, place baking sheet with ramekins on it in to the oven and place a large piece of tinfoil loosely over the top. Bake for 25 minutes. Remove from oven and spoon the remaining Brown Sugar Goo over-top, dividing it equally between all the ramekins. Return to the oven and bake (again, loosely covered with the tin foil), for an additional 5 minutes. Remove tinfoil and bake for an additional 1-2 minutes. Remove from oven and then remove ramekins to a cooling rack to cool. Serve with cream cheese icing as is, or heat it for 10-15 seconds in the microwave and pour it over the top of the ramekins. 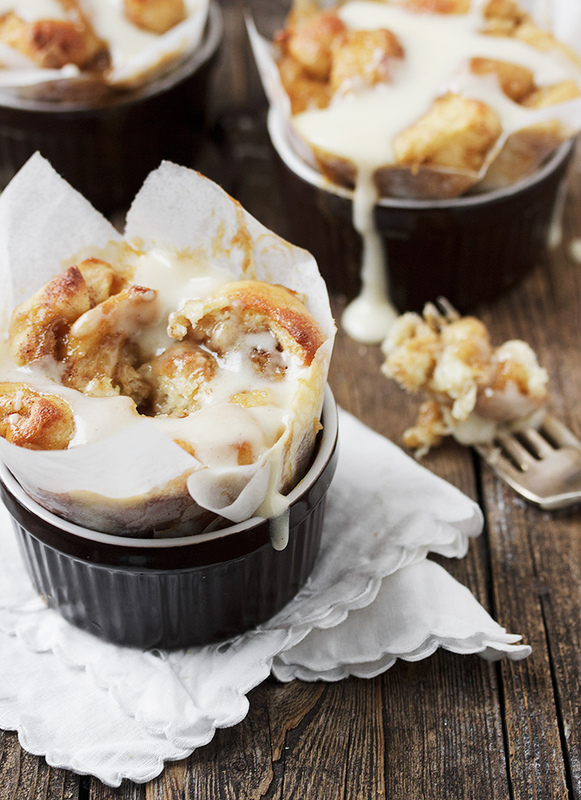 To make ahead and freeze: Allow bites to cool on a baking rack, then slide the ramekins in to a large freezer bag. Freeze. To thaw, remove from freezer and allow to thaw at room temperature overnight (or 4 hours or sin the freezer bag. Can be warmed individually in the microwave. You can also freeze the Cream Cheese Icing in a freezer bag. Thaw overnight in the fridge or for several hours at room temperature. 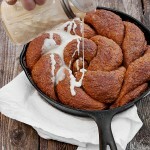 Cinnamon rolls for anyone who doesn't like to bake with yeast. 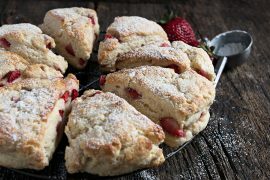 These buttery biscuits are delicious! 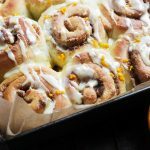 Easy and delicious cinnamon rolls, with a hint of orange. 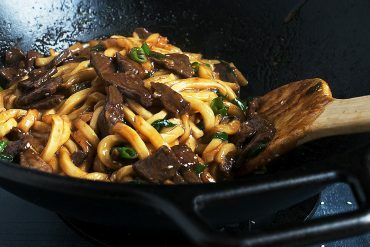 Delicious, easy and pretty, this one bakes up in your cast iron skillet. Oh my Goddd you are a baking Goddess Jennifer !! :) Whoevr gets married to you will be lucky ,that’s a guarantee . Are you married yet , lol ? 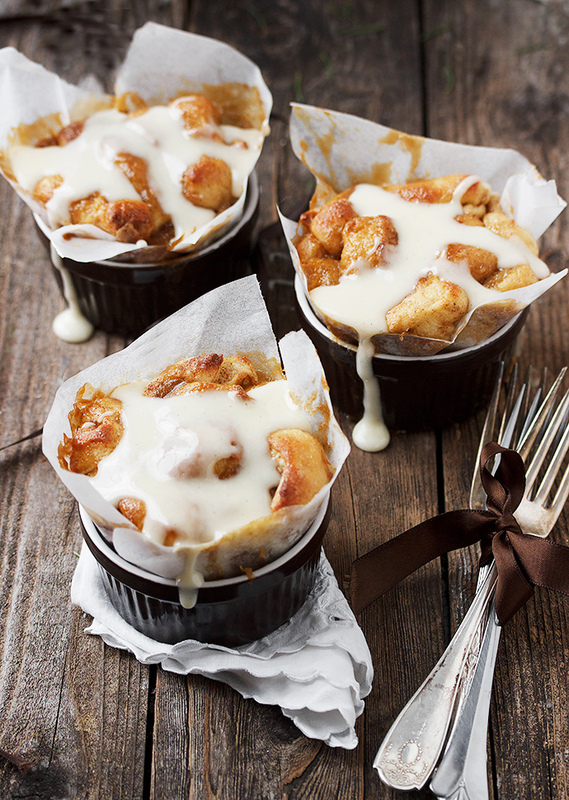 I love anything and any recipe involving cinnamon rolls! Do you think it’s possible to complete the recipe thru step 4, then refrigerate until morning, bake and then frost? Hi Rebecca, I haven’t tried that with this recipe, but I think it should work (a little worried about them over-rising, though). 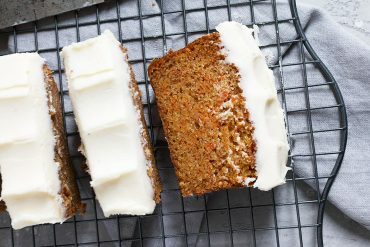 I tackled the make-ahead part by just baking off then freezing. Once thawed, a couple of seconds in the microwave and they were delicious! If you try it, let me know how it works out. 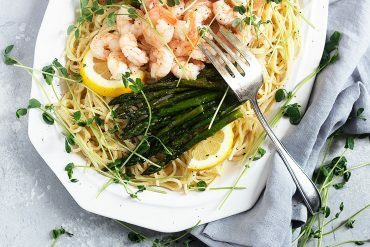 Thanks for sharing this recipe, Jennifer!! These are a little time consuming but SO worth it!! Oh I have no words! These look like little clouds of heaven! This has my family’s name all over it! I’m coming to your house for Christmas morning!!! Cinnamon rolls are my absolute favorite special treat. I cannot deal with the smell when they are right out of the oven. I have to eat them immediately and most of the time cannot stop. I wonder if these individual servings would help. Either way they look amazing! Jennifer I think you’ve just helped create a new tradition in our house…your photos are incredible! 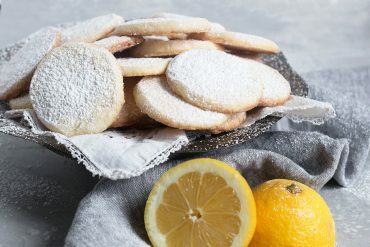 These bites look simply irresistible, what a perfect Christmas breakfast! Thanks so much, Laura. I can’t wait to eat them up! Thanks Sarah and I hope you do re-create that bun. Sounds absolutely delicious! Hoe lee cinnamon rolls. This is the best it gets in the baking universe. That first shot is making my mouth water! It reminds me of these morning buns at the bakery I used to work at. Chopped up croissants tossed in cardamom sugar, baked like a big muffin, and drizzled with orange blossom glaze. I’m determined to recreate it one day. Such an amazingly delicious idea! Christmas morning just got a million times better! These are totally dangerous. Gah! What an awesome idea!! This idea is GENIUS! I love how gorgeous the individual rolls look! I am totally stealing this idea for Christmas morning. Wow this looks amaizing – so cute too!